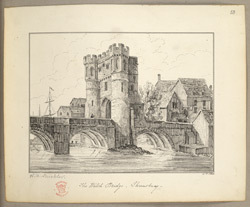 View of the old Welsh Bridge at Shrewsbury showing its large medieval gate tower (presumably based on an earlier view of Shrewsbury). Shrewsbury, was looped around by the River Severn, making it a bottleneck for road traffic, which made bridges around the town a necessity. Daniel Defoe visited Shrewsbury in the early 18th century, writing: "The Severn surrounds this town, just as the Thames does the Isle of Dogs; so that it makes the form of an horse-shoe, over which there are two fine stone bridges, upon one of which is built a very noble gate, and over the arch of the gate the statue of the great Lewellin, the idol of the Welch, and their last Prince of Wales." During the late 18th century, several new bridges were built, including a Welsh Bridge by in 1791-5 by architects Carline & Tilley. The new Welsh Bridge had five arches and a a balustrade. The new bridge relieved the bottleneck for commercial traffic around the Mardol, Shrewsbury's main port area.